Hermann Karl Hesse (1877 – 1962) was a German poet, author and painter who explored the ideas of authenticity, spirituality and self-knowledge in predominantly bourgeois settings. He was awarded the Nobel prize for literature in 1946. Steppenwolf (2018. 194 pages + 32 page pamphlet) was originally printed in 1927. This Folio Society edition has been translated by David Horricks who was previously a lecturer in German at Keele University. The book is illustrated by London artist, Dan Hillier. Taking the book as an object, it is another superb addition from Folio. The book measures 9 x 5¾’’ and comes in its own plain sleeve. The front and back covers have an embossed motif which make it look a little like wood block carving. 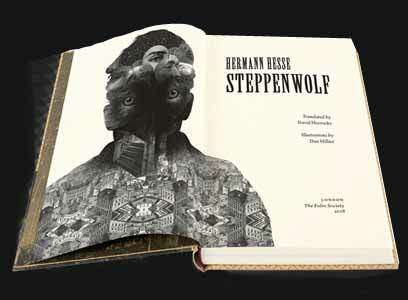 On the back is a picture of a wolf while three quarters of the front cover is covered with a slightly trippy rendition of, presumably, the hero illustrating the duality of his inner conflict just as the juxtaposition of the man and wolf stand to highlight the heroes sense of duality. Both the front and back inner cover has a two page illustration of stars falling onto a typical medieval German town. There is a further illustration, no less trippy than the first, of the main character. The book is printed on Abby Wove paper and bound in Napura paper. Inserted into the first quarter of the book is a reproduction of the pamphlet which Harry acquires from a street vendor. This is where you appreciate Folio’s great attention to detail. The pamphlet is smaller than the pages which contain it. The paper is different to distinguish it from the main text. Moreover, the text is set to look like it came off a cheap printing press. There is the hint of ink that has slightly diffused into cheap paper, giving a slightly fuzzy impression to the text. No less attention has been given to the translation. I have a very old edition of the book and Horricks has done a wonderful job of removing some of the linguistic anachronisms, while maintaining the integrity of the book and stylistically placing it back in the 1920’s when the original was written. I have only one issue and it is very picky, if the two had not occurred right next to each other I probably would never had spotted it. The translation of the pamphlet reads ‘On Steppenwolf: A Tract. 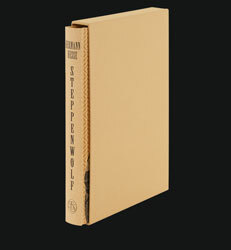 Not for Everybody’ when in fact the pamphlet itself reads ‘On Steppenwolf: A Tract. For Mad People Only’. I may be missing a subtle trick as these two phrases are seen together earlier in the novel, so maybe like Harry we are witness to the alternating message. The novel is a pamphlet within a book, within a book. Harry Haller is the central character of the book, a strange man who rails against the mediocrity of the bourgeoisie, their concern with cleanliness and order in a world full of liminality. He perceives himself to be the Steppenwolf of the title, half man half wolf, roaming around but never connected to the city he inhabits. This strange character is introduced by the nephew of his landlady. The central conceit of the book is that Haller has left behind a manuscript, which is found by the nephew. In presenting the manuscript the nephew prefaces Haller's work with his own editorial. The editorial tells of Haller’s arrival and describes his seemingly dual nature. His room is full of literature, indicating a man of learning, but the room is also home to numerous empty liquor bottles. He appears to have a lover, but rarely sees her and when he does they argue. Haller is seen drinking in less than reputable taverns, while at the same time affecting an air of superiority, all the while spewing forth political and social criticism. This section lulls the reader into believing that they understand Haller and his world, putting us at ease just before Hess unleashes a surreal novel that stands shoulder to shoulder with Kafka and Lynch. The book was written between the two great wars at a time when society was changing, and the military were on the rise much like the world of the novel. Haller is also in his own personal state of liminality, the self-definition of himself as half man half wolf, is a lie that he tells himself as another character points out. He is a man of independent means, the most bourgeoisie of states, he literally is the thing he hates the most, which accounts for his endless meandering about suicide, when he has no intention of killing himself. Haller’s part of the manuscript is suitably vague about the veracity of the events depicted which are certainly strange enough for a fevered dream as it mixes historical figures with his quest through the Magic Theatre striving for a greater truth and the internal unity denied by his current world view. In the end it is not important whether the strange events are real or not as they really represent a journey through the mind of the protagonist and Hess himself, as he tries to reconcile his competing multiple selves. So, a thought-provoking story presented to Folio's usual lofty standards.